We have the gutter guards you need from economical gutter screens,to hybrids, to durable guards that are scientifically tested and proven to keep debris out of your gutters!!! 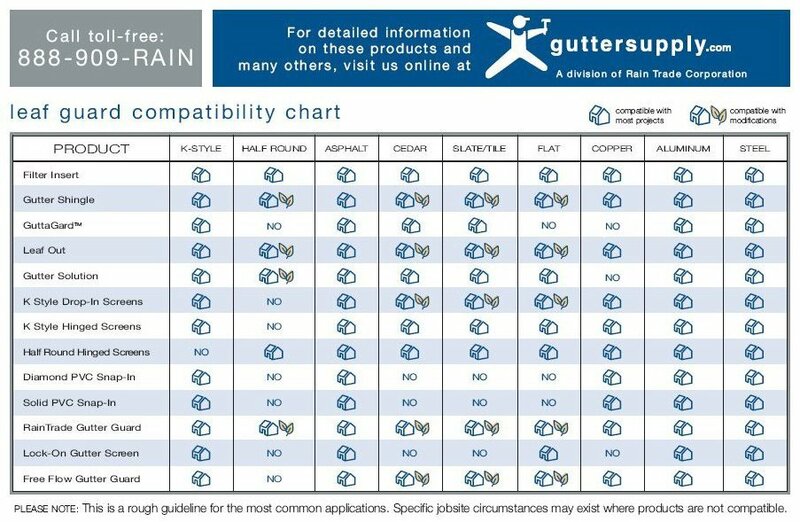 Is your house equipped with rain gutters made of copper? If so, congratulations—in many ways, copper may be the ultimate material for rain gutters. It is stronger than aluminum, has a beautiful finish when new, withstands the effects of weather well, does not deteriorate under the attack of UV rays from the sun, and gradually develops a beautiful green or gray patina over a period of years. In addition, copper rain gutters can last for 75 to 100 years or more. Almost every home is equipped with rain gutters. These rain troughs or eave troughs, usually made of metal, hang below the eaves of your roof to catch rain (or melting snow) as it runs down your roof. The rain gutters collect the water, then direct the water to downspouts, and finally direct the water on to splash pads that sit on top of the ground. This system prevents water from running down the fascia board, from possibly wetting the outside walls of you house, from collecting on the ground near the foundation (maybe leaking into the basement where it can do further mischief), and dropping onto the ground, possibly starting an erosion ditch in your yard. 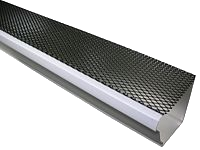 Solid PVC Snap-In Gutter Cover - This Solid PVC Snap-In Gutter Cover works on the principle of surface tension. Water flows around the nose of the Solid PVC Snap-In Gutter Cover and into the gutter through the slotted channel. This gutter hood will handle the heaviest of rainfall. It helps keep leaves, pine needles, and other debris out of the gutter. 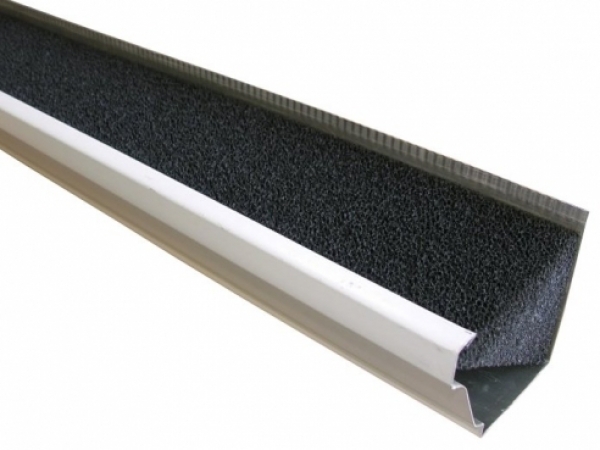 The Solid PVC Snap-In Gutter Cover has less debris accumulation then most gutter guards. Leaves and debris are carried away by wind and rain. Easy to install, the 4 ft sections fit standard 4ï¿½, 5ï¿½ and 6ï¿½ gutters. The Solid PVC Snap-In Gutter Cover simply slides under the shingles and hooks to the front edge of the gutter. No special tools needed for this gutter guard. 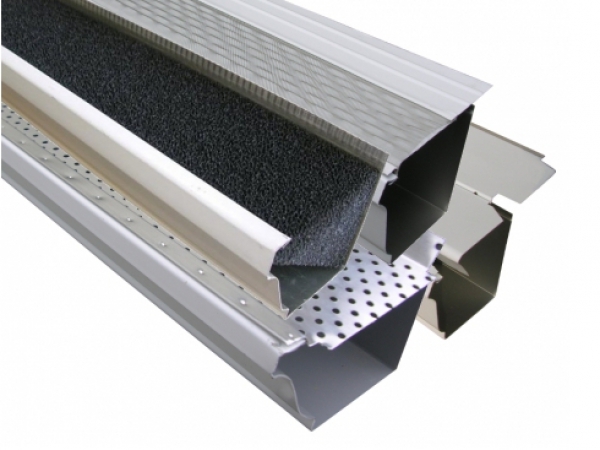 The Solid PVC Snap-In Gutter Cover flex design accommodates many different roof pitches. 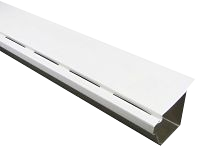 The Solid PVC Snap-In Gutter Cover is made of rigid PVC. Available in White or Clay. K Style Drop-In Gutter Screen ï¿½ The K Style Drop In Gutter Screen comes in 3 ft sections and each gutter screen has a continuous reinforced edge that clips on to the front bead of the gutter. The screen simply rests on the hangers and is virtually undetectable from the ground. The K Style Drop In Gutter Screen needs no fasteners or tools. This K Style Drop In Gutter Screen has long been the contractor favorite because of its ease of installation and affordability. Available in Aluminum and Copper. Lock-On Gutter Screen - The Lock-On Gutter Screen is the strongest gutter guard screen product for the money. The Lock-On Gutter Screen is made of durable powder coated steel, which will not collapse under ice, snow, or debris. The Lock-On Gutter Screen comes in 4 ft sections and is available for 5ï¿½ and 6ï¿½ K Style gutters. Color: Black. 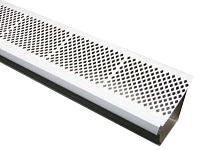 Diamond PVC Snap-In Gutter Cover - The Diamond PVC Snap-In Gutter Cover installs in seconds by snapping onto the front edge of the gutter. 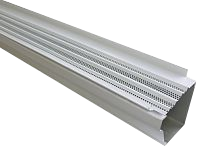 Handy 3 ft. sections fit standard K style metal gutters. The gutter cover is made of high quality, rigid PVC. Snap-In design will not collapse under debris. 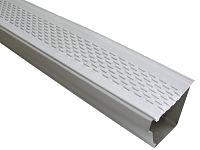 The gutter cover is available in white, brown, or black (Fits 4, 5 & 6 metal K gutters). Filter Flow / Filter Flow XT Gutter Filter ï¿½ The Filter Flow / Filter Flow XT Gutter Filter keeps your gutters clean and free of all debris.Â The Filter Flow Gutter Filter has a flexible design. It will not dent or crack like other aluminum gutter leaf guards, gutter guards, gutter guard, gutter helmets, or gutter shields. The Filter Flow Gutter Filter is treated with a pesticide (prevent mosquitoes from breeding and bees from nesting), a fungicide (inhibits growth of mold, mildew, fungus, algae, and moss), it is fire retardant, and is UV protected. The UV stabilizer prevents degradation from the sun. Made from a Multi Polymer Thermally Fused Filter. 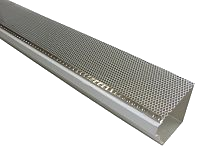 Gutter Shingle Gutter Cover ï¿½ The Gutter Shingle Gutter Cover completely covers the gutter, and the fine mesh allows the water in and keeps the smaller debris out. The Gutter Shingle Gutter Cover is textured and blends well with shingles. It is contractor quality with easy installation. It will handle vast amounts of rainfall. 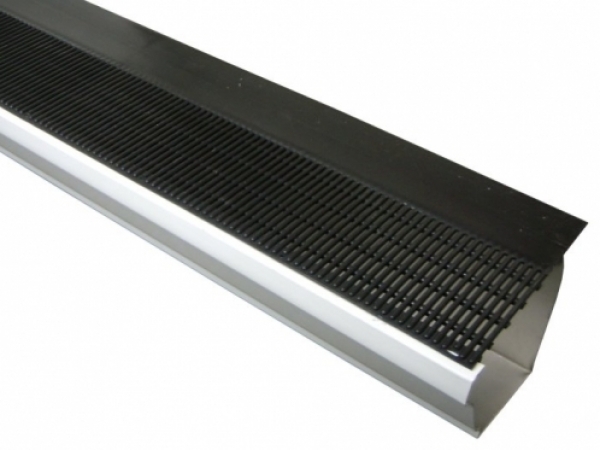 This hybrid gutter guard is available in copper and steel. The Gutter Shingle Gutter Cover can be installed on any pitch roof. 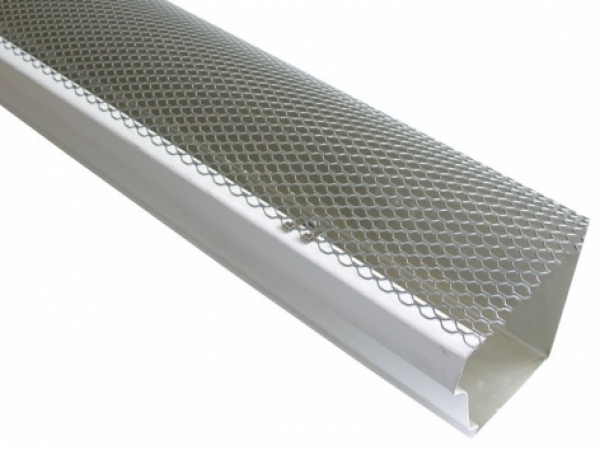 Leaf Out Gutter Guard ï¿½ The Leaf Out Gutter Guard combines the idea of leaf screens and gutter leaf guards hoods/gutter guards. Rainwater flows down your roof and drains through the patent-pending Aluma Flow Louver System. 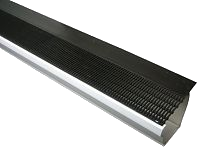 This gutter leaf guard/gutter guard has been tested to handle up to 28.4 inches of rainfall per hour. The Leaf Out Gutter Guard is available in many colors to match your gutters and roof. 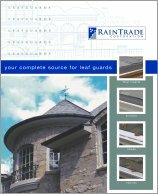 Raindrop Gutter Guard ï¿½ The Raindrop Gutter Guard is a unique design that is easy to install and manufactured to withstand the elements; it is one of the most durable gutter guards/gutter leaf guards products available. The Raindrop Gutter Guard adds only 1/4 inch to your gutter height so it will NOT change your home's appearance. Itï¿½s made of polypropylene plastic; it has tiny slots both vertical and horizontal to keep the leaves out, and water flowing. Gutter Solution ï¿½ The Gutter Solution has tiny holes, which allow the water flows and keeps the leaves out. Both affordable and efficient, the Gutter Solution is our most versatile product for keeping the leaves out of your gutter. Gutter Solution gets installed into the fascia board, and not under your roof, which makes it the leaf screen of choice for houses with metal, shake, tile, flat and slate roofs. The Gutter Solution is simple to install, just apply (2) zip screws through the top, front bead of the gutter, and (2) long sheet metal screws into the fascia board. This gutter leaf guard/gutter guard is undetectable from the ground. The Gutter Solution is made of aluminum and available in many colors. Trim-A-Gutter ï¿½ The Trim-A-Gutter will form industry standard 4 ft. lengths from standard trim coil or gutter coil. This handy tool allows you to form a gutter cover to virtually any roof pitch or profile, right on the jobsite. 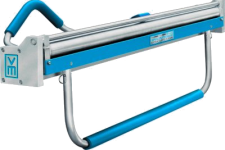 Trim A Gutter tool comes complete with UniMount hardware for mounting to any Van Mark brake, or independently using UniLegs. The Trim-A-Gutter allows rainwater to collect and cascade over the gutter covers, while this is happening a natural surface tension is being created causing the rainwater to follow the contours of the gutter covers. As soon as gravity takes over, the rainwater clears the gutters edge and falls into the gutter itself. The Trim-A-Gutter doesnï¿½t allow leaves, seeds, and twigs from making it into the gutter. Wire Strainers - Wire strainers prevent leaves and other debris from clogging downspouts. To install a wire strainer, simply place the gutter strainer inside the outlet tube that connects the gutter to the downspout. No fasteners or tools are needed to attach a wire strainer to the outlet tube that connects the gutter to the downspout. 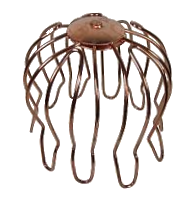 Wire strainers come in sizes of 3ï¿½ and 4ï¿½. The 3ï¿½ wire strainer is available in aluminum, steel, and copper, while the 4ï¿½ wire strainer is available in aluminum, steel, stainless steel, and copper. Heavy duty and standard designs also available. Flex-A-Spout - The Flex-A-Spout is able to bend around obstacles so that it can divert rainwater away from your house. 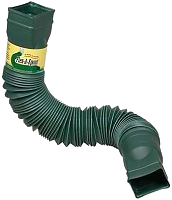 The flexible downspout extender adjusts to your landscape needs: if bushes are in the way, just bend this extender around them; to extend it further from your house or all the way through shrubs, "telescope" it between 25" and 55". For longer lengths, two or more snap together easily. Bend it up for mowing. The Flex-A-Spout can also be buried, if needed. The Flex-A-Spout is a durable, weather resistant polyethylene. The Flex-A-Spout fits 2" x 3" or 3" x 4" downspouts.